Can Thomas Keller do no wrong? Well, apparently he's not capable of doing bad food.... even if the food is an add on behind one of his restaurant in Yountville. 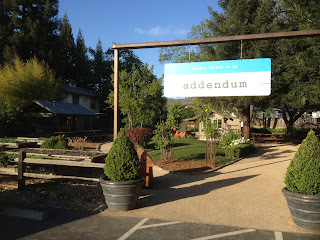 Addendum is only open Thursday to Saturday. For $16.50, you can have a choice of either their famous buttermilk fried chicken or barbeque between 11:00am-2:00pm. Try both but buttermilk fried chicken was my favorite of the two. It's the best buttermilk fried chicken I have in the SF bay area. They were finger licking good. You can order the food online and just go pick it up. I would highly suggest that as I'm not terribly fond of waiting in line for any food unless it's French Laundry for $100 (as if!). A definitely stop by if you are craving for a quick bite in the wine country.